For many people, Easter is a commercial holiday that can be summed up in a basket of colored eggs and chocolate bunnies. For our church family, it’s a chance to minister and partner with God in his redemption plan for our world. It’s being part of sharing the hope of Jesus with our church and community. Most importantly, Easter is a time to stop and to be with Jesus — to remember his life, death, and resurrection. It’s so easy to get caught up in the work or Easter: preparing for guests, hiding Easter eggs for the kids, and making the day perfect and memorable for those around you. In Luke 10:38-42, the Bible talks about Jesus coming to visit the two sisters, Mary and Martha. It says Martha was overwhelmed with the work of putting on a big dinner. She cleaned the house, prepared the food, and probably decorated the table for the guest of honor. This important work was Martha’s way of showing Jesus how much she cared. But then there was a moment when the work needed to be put aside. Jesus was there. Martha continued to stress over the small things, while her sister Mary sat at Jesus’ feet … being in his presence, listening to his words, just being with him. Martha had some words to say about her sister, but Jesus reminded her that worship should take priority over the work. As we enter this Holy Week, let’s make sure that we don’t miss the chance to have Mary Moments with our Jesus. Let’s make sure to have times of worship, thankfulness, adoration, gratitude, and celebration. Let’s spend with Jesus, not just for Jesus. Maybe it’s taking a few minutes to read through the Easter story in the New Testament. Maybe it’s turning on some worship music. Maybe it’s going outside and watching the sun set (or rise), maybe it’s going to a worship service and setting your intention to just receive and BE. There is a sweetness to be found only when you stop the work and let the presence of God be all you need and all you desire. It’s not easy, it’s a spiritual discipline, but this is where we get the joy and the strength in our faith, and for returning to the work with passion, focus, creativity, and energy. Easter is an opportunity to open wide the doors of our church to fulfill the Great Commission and the Great Commandment. All of our 19 Saddleback campuses hosted special events to celebrate Easter and fill God’s house. Beginning on March 29, people from the community were invited to enjoy Easter egg hunts, pancake breakfasts, family photo opps, and more. At our weekend services, Pastor Rick announced the launch of Doors to Your Destiny, an 8-week spiritual growth campaign. This life-changing series will introduce our church family to eight powerful keys to unlock the doors to our destiny. Sometimes, growing requires moving pastors between campuses to make room for the next season of expansion. That’s why this month, Pastor Rick announced the addition of two new pastors at our locations in Irvine South and San Clemente. Taking the helm at Saddleback Irvine South is Kyung Lee, who transitioned from his role as Pastor of Campus Launches to serving the greater Irvine community. The shift came about after Kevin Nguyen, who previously shepherded the Irvine South campus, took on his new role over Team 301 ministries at Lake Forest. Click HERE to read our interview with Pastor Kyung and his vision for Saddleback Irvine South. At Saddleback, it’s fairly standard for the leadership team to be fast, fluid, and flexible — especially when it comes to shepherding our members and filling God’s house. That’s why on March 10, Pastor Rick commissioned Eric Falcinella to be the new Campus Pastor of Saddleback San Clemente. After seven years at Saddleback, ministry is nothing new to Pastor Eric. He’s served in several capacities including Pastor of Guest Services, Pastor of 301 Mobilization, 101 Pastor at San Clemente, and Pastor of Network Development. Click HERE to find out how each role has taught him something important to bring to the table as San Clemente’s Campus Pastor. A – ASSIST 250,000 PEOPLE IN NEED THROUGH OUR LOCAL PEACE PLAN. In the eight years of its existence, Saddleback’s PEACE Center has provided basic resources and assistance to people in need. From programs and workshops to food and training, over a dozen services are offered to the community through our PEACE Centers across Orange County. In order to continue God’s work in this ministry, our PEACE Centers at Lake Forest, San Clemente, and Irvine South are introducing new programs and outreach opportunities to assist more people in need. Click HERE to find out which Food Pantry is expanding, and the new educational programs that are reaching the community for Christ. Saddleback’s Tech Team has officially started transitioning away from Staffnet to the New Healthy Church platform. This new program provides the foundation for our church to begin releasing new tools enabling our members to have a personalized engagement with the church. Stay tuned for the official release later this year. If you’re a member of Saddleback, chances are you’ve discovered what we believe and why. That’s in part because of our Christian Life And Service Seminars (CLASS) that help people take the next step in their spiritual journey while training them to be leaders —the “T” goal of Daring Faith. These four steps to grow in faith are only possible with the right tools in place. That’s why after several decades, our Creative Services team is releasing a revised version of CLASS materials. All four books have been rebranded, redesigned, and refreshed as part of the 2018 vision. Click HERE to check out the newly designed materials and how CLASS can help you discover your purpose. Since Daring Faith first launched in 2015, Saddleback members have taken great strides to become equipped as trained leaders in ministry. To help meet this “T” goal, our Spiritual Maturity Team recently launched Conversations in Spiritual Maturity. These quarterly discussions are relevant to spiritual growth, and also help our members articulate their faith to become ambassadors for Christ in their spheres of influence. 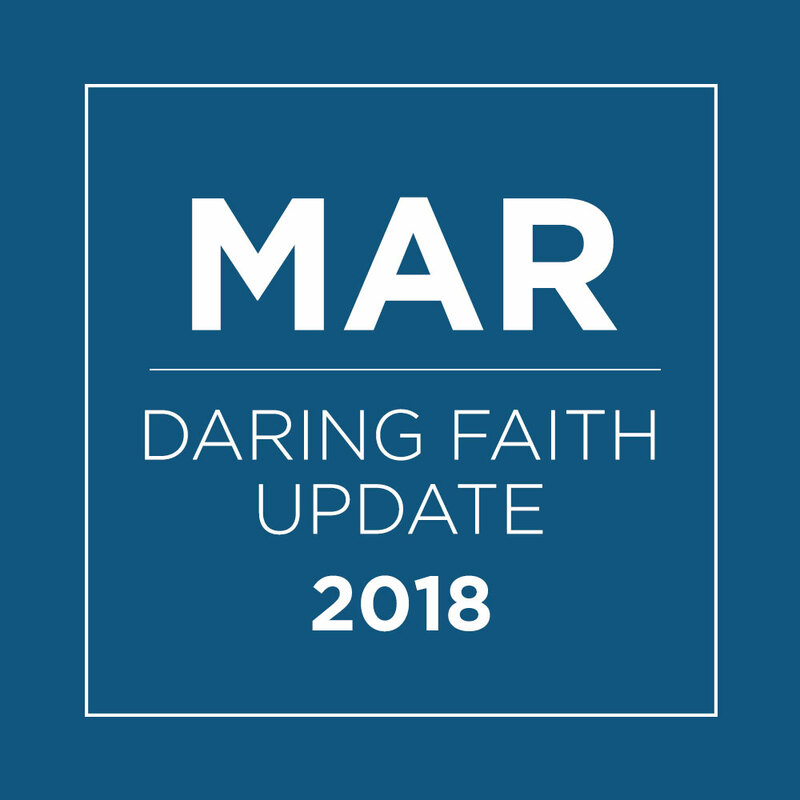 Click HERE to read about the latest gathering on March 21 and how the relevant topic helped members broaden their spiritual understanding and deepen their relationships with God. Saddleback volunteer, Dean Hansen has a heart for the Purpose Driven (PD) Church that started in 2016. After transcribing dozens of training videos, he became fascinated with the PD model. In just two years, Dean’s PD knowledge has impacted churches both locally and internationally. Click HERE to read how Dean’s passion for PD literally started by accident.